Raw Milk Herd Shares from 100% Grass fed 100% A2A2 Dairy Herd. Beyond organic, multi-generational family run operation. Raw Milk herd share program to Alexandria, Mt. Vernon, Fairfax, Burke, Leesburg, Aldie, Ashburn, South Riding, Madison, & Culpeper. 3/28/19 Good News – we have raw milk & yogurt shares available! After being sold out for most of the last 6-9 months, we are grateful to have shares available. Contact us today to reserve yours! The only raw milk you can drink is the milk from your own cow or through owning a share of a herd as it is illegal in Virginia to buy and sell raw milk (milk that is unpasteurized). Therefore on Honey Brook Farms we have provided the opportunity for you to board your herd/cow on our farm. 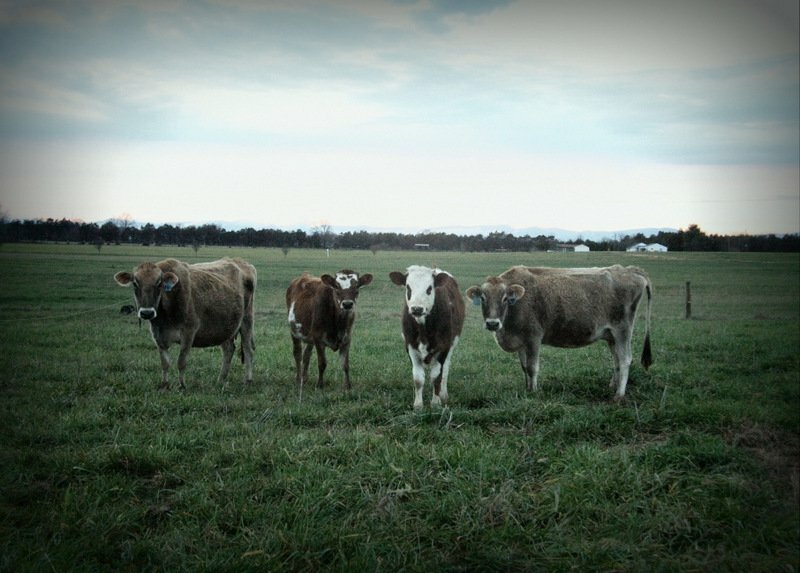 Our 100% grass fed (no grain ever) herd is tested and 100% A2/A2. We’ll do all the work of feeding, caring and managing and you will receive your milk from you’re herd/cow. You can sign-up now to reserve your shares. 1. What is a herd share? It is an investment into a herd which makes you a part owner in a dairy herd without you having to care and feed the cows. 2. What kind of cows are on Honey Brook Farms? On Honey Brook Farms we milk Jerseys. Our herd is 100% A2A2. 3. What do the cows eat? Our cows are 100% grass fed. Our pasture is free from all chemicals and synthetic fertilizers. They are on pasture throughout the entire year, until grass stops growing. In the dormant months we feed our cows hay which is also free from chemicals and synthetic fertilizers. While it may be customary to supplement with grain during milking, we do not but rather provide non-GMO alfalfa hay for our cows (during milking), which provides excellent nutrition and keeps them content while being milk. They are not in confinement and so live a stress free life that results in quality milk from happy, peaceful, grazing cows. They are never given hormones, chemicals, or unnecessary antibiotics at all. We also only use antibiotics in cases of emergency and then we withhold the milk for a longer period than required by organic. Though through proper care and natural remedies we have had very little antibiotic use. 4. What is so good about raw milk? The health and nutritional benefits found in raw milk are far superior to that of pasteurized milk. Many people who have experienced intolerance to pasteurized milk have found no issue with raw milk. Raw milk from cows on fresh pasture provides an incredible amount of nutrients and beneficial enzymes that are necessary for the health of the human body and are destroyed through pasteurization and homogenization. We are committed to providing a product that will benefit you and your family, for this generation and the ones to come. Here are two websites that provide some more information on the benefits of raw milk. 5. Is it legal to sell and buy herd shares in VA? Yes, it is legal? In Virginia you are only allowed to drink milk from your own cows. Through purchasing a share of our herd you are literally receiving milk from your own cows. You can buy as many shares as you would like, and use your milk in any way you find desirable. 6. How is my milk supplied to me? Milk is supplied weekly at both the farm and drop off locations throughout the area. Fairfax City , VA – Wednesday afternoon drop-off to a chiropractor’s office off Main St with pickup during their office hours: Wednesday 9-3, Thursday 9am-12pm, or Saturday 9am-12pm. We are working towards adding additional drop-offs – stay tuned. 7. How does Honey Brook Farms work the herd share program? To get started there is an upfront investment of $100 to buy 1 share of Honey Brook Farms’ herd. One share costs $100. After you buy a share, you truly own a part of the herd. These fees are investment fees which are used in building the dairy herd and infrastructure in order to maintain high quality dairy products. In addition, there is a monthly $40/share boarding fee which covers the feeding and care of the Herd. One share entitles you to one gallon of milk every single week. You can buy as many shares as you would like and find conducive. Note that you can terminate your contract at anytime and for any reason with a 30 day notice. Example 1: I would like to receive a half gallon jar worth of milk every week…how would that work? You would need to buy 1/2 share, which would cost you $50(this is a one-time fee). The monthly boarding fee would be $20 per month. There would be an additional $10 delivery fee. Example 2: I would like to have 2 gallons every week…how would that work? You would need to buy 2 shares, which would cost you $200(this is a one time fee). The monthly boarding fee would be $80 and there would be an additional $10 reg. drop delivery fee. 8. What is milk contained in? Milk is contained in glass jars that are labeled with your name. What would my total costs be? 9. How are jars cleaned? All jars are labeled with the shareholder’s last name so you only receive milk in your jars. The shareholder returns their jars cleaned & air-dryed each week. If your jar is not returned, we will provide milk in plastic jugs at a cost of $1/jug used. 10. How long will raw milk last? Raw milk should last 7-10 days or longer, provided there is adequate refrigeration. It essential to make sure the temperature of the milk is maintained at 35 degrees. If milk is not staying fresh, make sure the following are being practiced. Use a cooler when transporting milk after picking up your share, and be sure there is adequate ice to maintain a temperature of 35 degrees. Do not let milk sit out for long periods of time. If you are following these precautions your milk should maintain a sweet and fresh taste. 11. Will the milk always taste the same? Raw milk is very different from pasteurized milk. There are a few times throughout the year, due to the pasture and hay (in winter) and the affect that the seasons have on it, the milk will have different tastes. This does not mean in any way that the milk is bad. We encourage you to try turning it into a different use. Check out our Recipe page for some ideas. 12. What should I do if I am on vacation? We encourage you to share some with family and friends. Or have someone freeze the milk for you so that you can enjoy it when you come back. The shareholder is still responsible though to pay the monthly boarding fee, as the cows still require the feed and care for their productivity and health.